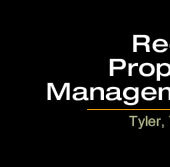 The Reed Family Ranch is located within both the blackland and oak woods prairies of north central Texas. 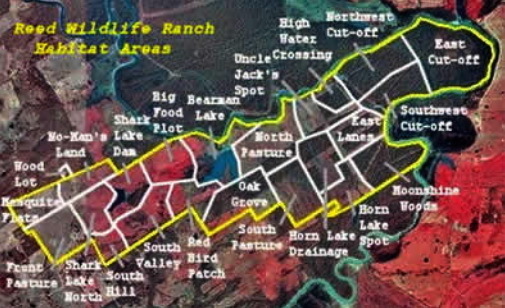 Most of the Ranch is located within the wildlife habitat rich Trinity River Basin - which extends from north of the Dallas area all the way to the Gulf of Mexico. 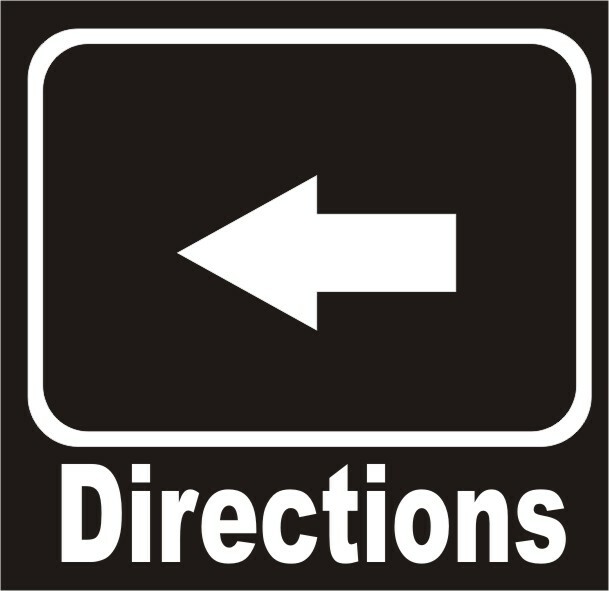 Directions for getting to the ranch can be found by clicking HERE. Although it is possible to improve wildlife habitat and soil composition with the use of a rotational cattle grazing system, the presence of cattle on the land is not aligned with the landowner's goals at this time. Feral hogs include domestic swine gone wild, European boars, and crosses between the two, have been in the area for a long time. Feral hog distribution in Texas is very similar to white-tailed deer, occupying most of the same habitat. The numbers of feral hogs have increased dramatically during the last decade. The tell-tale signs of rooted up pastures are common in upland sites as well as marshes, creeks, and river bottoms. Feral hogs compete directly with deer, turkey, squirrels, and other wildlife for acorns, fruit, mushrooms, and other native foods, especially in bottomland hardwoods. They are opportunistic in their feeding habits, eating anything from corn to dead animals. Deer have the tendency to avoid feral hogs, and will usually not stick around if one is present. Some say that the feral hog is the most prolific large animal in the United States. A sow may have two litters a year, averaging four to six pigs per litter. These pigs normally begin breeding at 8 - 10 months of age. 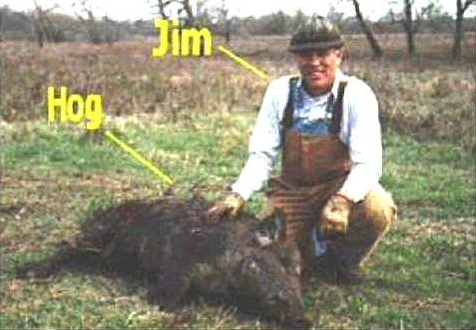 Feral hogs are hunted and trapped on the Reed Family Ranch year-round and can produce good meat for a hearty meal. Usually, landowners, hunters, and wildlife watchers would prefer seeing two or three times more deer on a tract of land than the land can support over the long term. When populations increase to the extent that deer do not have sufficient nutritious vegetation to sustain them in a healthy condition, deer populations are considered to have exceeded carrying capacity. 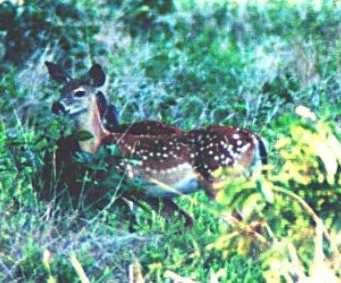 When deer populatons exceed the carrying capacity of the land, browse lines on vegetation may be obvious; fawn survival is poor, body weight and antler size is poor, and losses from parasites and disease increase due to malnutrition. Most grasses, especially non-native grasses, are seldom utilized by deer. The deer's digestive system, unlike that of cattle, is unable to digest the course cellulose and fiber of mature grasses. Deer can utilize grass only when it young and tender. Deer have been known to starve while their rumen is full of grass. In the geographic area which the Reed Ranch occupies, mostly during the mid 1950's, acreage of uplands woods and well-drained bottomlands were cleared and planted with non-native grasses, thought to be highly valuable to improved cattle management. Also, during this period, increased continuous grazing of large numbers of cattle had a negative impact on the viability of native grasses such as switchgrass, gamagrass, and bluestem. When the viability of native grasses decreased, much of the food and cover also decreased for various forms of wildlife. A portion of the Reed Family Ranch's goals is to increase the viability of native grasses over all the Ranch. In the bottomlands, alamos switchgrass and eastern gamagrass are the two species that are being introduced and managed with a cattle grazing system. In the uplands, the Ranch is seeding pastures with oscela, tripoli, crimson and arrowleaf clover; and is increasing the amount of singletary peas, vetch, and bluestem though cattle rotation. 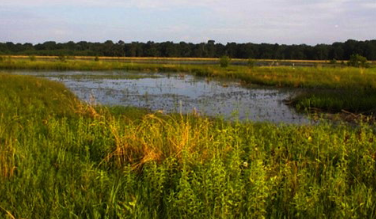 In 2000, the Ranch was the recipient of a forested wetlands cost-share program with the Texas Parks and Wildlife Department. During the summer of 2000, a selective cut of mostly cedar elm and green ash removed about half of the overstory for the planting of wildlife friendly seedlings. In the winter of 2001, over 16,000 oak seedlings were planted in the area behind the cut-off, as well as about 400 bald cypress seedlings being planted directly in the cut-off. 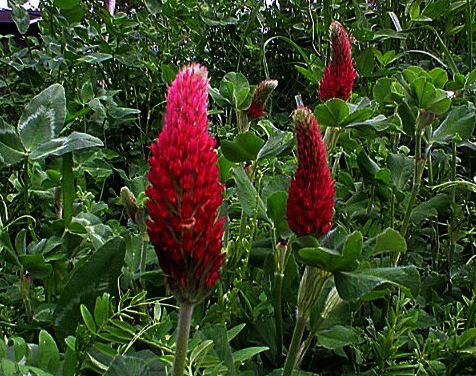 The success rate of these plantings continues to be monitored.